From beads to sequins, the LB Sora Skirt is a pleasant surprise. Monochrome and ordinary-looking on the website, this skirt in reality is a work of art. The varying patterns, put together, present themselves so coherently. 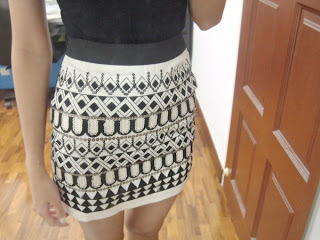 In black, white and gold, the sequins come together and give the skirt that much more definition and class. Upon scrutinising it, I thought of how fishes would not look as beautiful without their glimmering scales, as would this skirt, if not for the sequins.